I’ve been sick all week so far. On Sunday night, we left our house and drove to the apartment. We drove and we drove and we drove. It was really dark when we got here, and one kid was sick on the way. I spent Monday in bed. Or rather, on the futon. I did manage to shuffle to the computer and post some most likely incoherent messages on various places I visit. Tuesday was marginally better, but this time with headache. We went and saw the falls at Grand Falls. They are. We have also spend considerable time driving around the countryside in the evening, looking for things to do, places to see, house for sale to gawk at. I am always astounded at how we do so much driving when we are here, since we drove so far to get here you’d think we’d like to stay put. Also, five people sharing one computer. The hardships never stop. I got a tv antenna so now we get one fuzzy station. Today I felt almost better, and then we found the local pawn shop, and the guy who runs it knows the guy who ran the one back home, so now we are friends, and some guy gave Emma a hard time and a Toonie for bugging her. Sarah found (what else) a pile of CDs. There was a sign in the store that said “Unsupervised children will be sold as slaves” but I couldn’t get away from them. We’re having company on friday too. Another homeschooling family, so I think we should buy a fair-sized house over here and open a b&b for homeschoolers. I shall call us the Travelling Homeschoolers Welcome Commitee of New Brunswick. More tomorrow perhaps – there’s too much swirling in my head at the moment. It’s a good thing it looks so nice, considering how much work all this is. Nothing is hooked up there (I mean, none of the sink – tub and toilet work), that will be for next weekend – after Ron drives Addison and his entire room’s worth of stuff (including a fish tank) down to the City by The Sea where he’s going to college. The girls and I are going over to the apartment with Ron tonight. Addison will spend the week finalizing all the details before his move. Sarah brought home a cold from work, so we’re watching as it make its way through the family. So far, it went from Sarah to Meaghan and Addison last night, and to Emma this morning, and finally me and Ron this afternoon. Fun times ahead, I can see it now. It’s going to be a busy week, so I may not be posting anywhere every day. We’ll have to see. And it flushes. It wonderfully flushes. 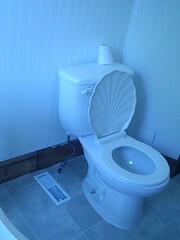 It took me twice as long as it should to put the toilet seat on, as someone was kissing the back of my neck. The first time I managed to get it on backwards. The second time, Emma decided I looked good for horsey rides. It lights. Its mate needs even more work, as something is not right with the wiring. We’re skipping that for a bit, as it can be done later. 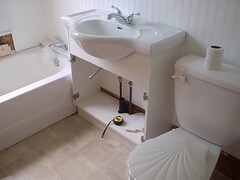 Also, you may notice it’s not quite sitting right, which will also need to be tinkered with, but we chose to skip that too and head right to installing the toilet last night. Good news, yes? Ah well, don’t hold your breath and clap just yet, as we found that somewhere beyond all the new pipes we put in, out in the cavern of the middle of the house where we can’t see or feel it yet, the bathroom drain leaks right onto the basement floor. Good thing half the basement floor is dirt. But it is one more thing on an ever-expanding, not shrinking, list. But now I have a dumpster out there. So he were are on the downward slide ot the end of the week, and I must actually get some more stuff done. Reorg those lists, buckle down and actually, you know, DO stuff. 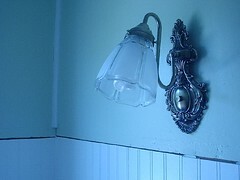 One coat of paint on the lower half of bathroom walls already, so that’s a start. She has also invented a “game” with Addison, called Battle Ball. You have a ball, she has a ball. Thankfully, one is a blow-up dollar-store beach ball, the other is almost as big and soft. Each person throws the ball at the other person at the same time. You have to try and catch it. Fun starts when the balls hit each other and fly off in various directions. Yes, they play this in the living room. Emma was also exploring our overly-crowded attic and found her puppy on a string. We were tickled as she loves it just as much as she used to, but whenever we each asked her about “Fish-Pup” she’d give us a look. “Don’t you remember?” Addison asked her, explaining how she saw the tag when she was little and thought it said Fish Pup, for the puppy’s name. She wrinkled her forehead at us. “No, it doesn’t say that. It says Fisher Price!”. Then she muttered “sheesh!” under her breath and rolled her eyes at us. Just now, she wanted me to look at the book she picked up at the library. It’s the history of Looney Tunes, and as I turned the pages, she explained about storyboards. Her vocabulary is pretty intense at times. She’s also very interested in left and right.